We have a wonderful customer whose name is Robert Sweetgall. He has a teacher’s heart and he teaches everybody he meets about the benefits of a healthy active lifestyle. You can find out more about him at his website www.creativewalking.com . 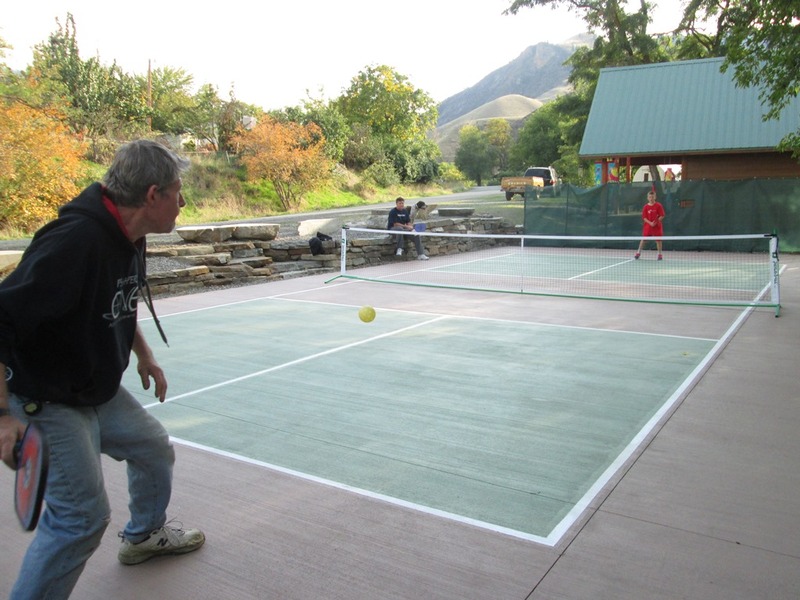 He has recently added pickleball to his fitness “curriculum” and he has quite a story to tell about his latest pickleball court construction project. 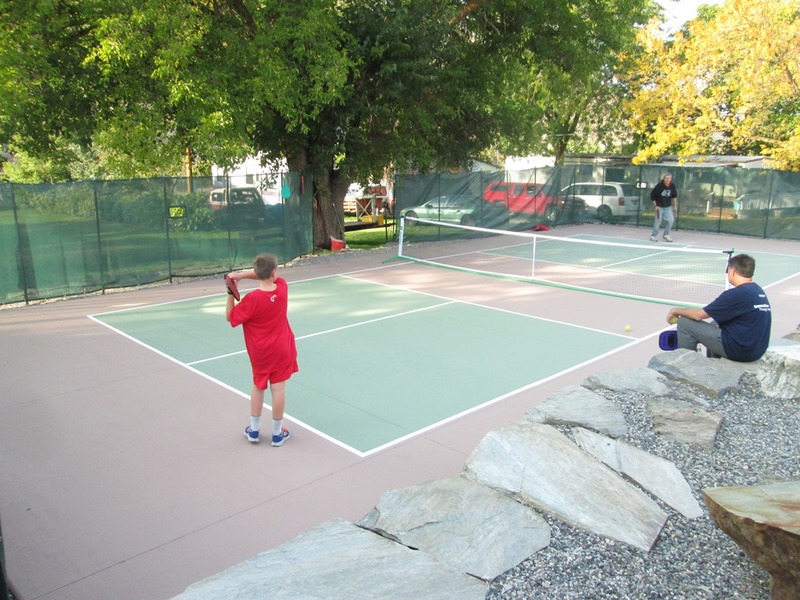 Robert has built a private court in Lucile, Idaho and invited all of his neighbors (the unofficial population of Lucile is about 100 people) to come play pickleball. His court is named Harttrup Court after Ed Harttrup, a cancer survivor, who donated 38 yards of concrete to Robert’s pickleball court construction project out of gratitude for helping him make nutritional and lifestyle changes that helped him to beat cancer. Robert has also put a lot of his own blood, sweat and tears into this project. Building dry-stack rock walls is one of Robert’s hobbies. He built a 4-foot bordering dry-stack rock wall, made of hand split slabs of stone he collected. The wall is designed to be a multi-purpose wall: it acts as a retaining and a ball kick-back wall and is a seating gallery for spectators. Robert also installed 6-foot green wind screens around 3 sides of his court that minimize wind effects and keep balls from running wild. Robert used a concrete stain on his court, which provides good traction and consistent ball bounces. He picked a unique color scheme: artichoke green for the serving boxes and mocha chocolate for the apron and the kitchen no-volley zones. Robert loves teaching pickleball, especially to people who are new to the sport. He taught 100 novice seniors the game of pickleball at Hilton Head, South Carolina on October 18th of this year. His main goal is to instill a spirit of fun play, with the promise of quick improvement with a few simple skill drills. Do you know of a beautiful backyard pickleball court? Tell us about it and send pictures. We’d love to share it on our blog.